After leaving Connecticut, rather than a more direct route to Ukazoo, I veered to the East and stopped in Ocean City, Maryland. At week’s end, while sitting in a local tavern, enjoying the company with a few of the regulars I had met during my stay, we quelled our conversation to listen to an interview on the radio, hosted by a local DJ, DJ Batman. DJ Batman plays music, lots of great music, but today, in-between tributes to two classic bands, he slotted a 15 minute interview with a local area college professor. The discussion centered around the professors in-progress Thesis about what Maryland Blue crabs actually do during the winter months. Well, the six of us, already in a very loose “got some time on our hands” mood, called the radio station during the question and answer segment, to avail ourselves to the professors suggested underwater quest for answers. Keen as the offer sounded, the good professor did a back-track on his grand plan, admitting it was far too cold for him to do any diving and he was very much content to get his information off the internet. Well, that wasn’t fair, with our curiosity now primed, we announced over the airwaves, without considering logistics of such a project, we would tackle this issue ourselves. DJ Batman, intently listening to our call to action, seized the moment, and promptly put out an on-air request for donations of any equipment, supplies, or help we might need for our underwater endeavor. Filtering into the Radio Station, over the next several hours, were scuba diving outfits, lights, rope, a couple of tents to warm up in after the dive, hot chocolate, even a couple of donuts. One of our group, Gerard, wanted the kind with sprinkles on top. With DJ Batman setting up an on-location remote, on a nearby pier, to provide listeners with live updates between songs, it was only natural that he started off the event by playing “Sittin’ on the Dock of the Bay”. The bay still iced up from a recent cold front, we had to cut a large entrance/exit hole. Of our group, Briggs and Cosmo volunteered to stay behind to keep the ice from reforming around the hole and work the guide-lines hooked to each of us. Gerard, Poole, Newman and I, donning wetsuits, air-tanks, facemasks, and my camera, also took some soft-glow flashlights, as to not startle the underwater residents. At first, we only spotted a few small groups of crabs, some just relaxing, others conversing with a few fish on their way to school. As we proceeded onward, we noticed the crabs lifted an upward turned claw to their mouths. Of more interest was a couple of crabs, sitting on rocks, reading books. One, a short story, entitled “Chicken Necks, Do You Really Need One.” and another, a novel, “Soft Times/A Hard Life ”. Again, as we continued on, each crab put a claw to their mouth. The most intriguing sighting was near the end of our dive. 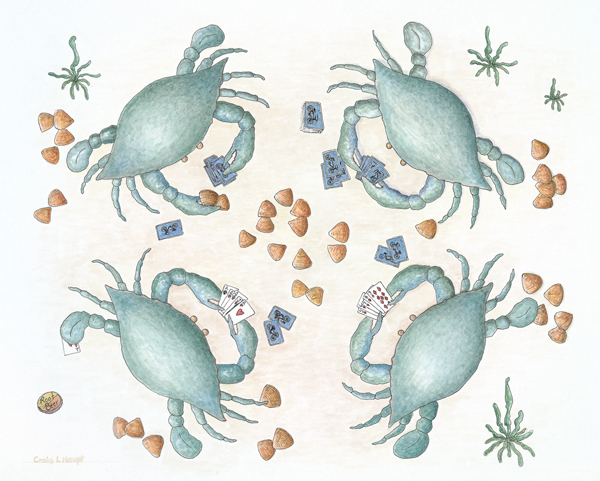 As we looped back around for our return, we came upon a foursome of crabs playing poker. We paused, to watch the hand play out. I took this picture as the final bets were being made. Newman, gave a slight hand signal, directing our attention to our left, where we noticed the one crab concealing an extra Ace. Noticing ours eyes shift, the other three crabs, always alert to picking up on a “Tell”, did a shuffle to the left and right to check out the nature of our interest. Seeing the partially hidden Ace, their front claws shot upwards churning the water, becoming livid by the audacity that one would cheat. They banished him from the game. Retaining his forfeited clams, the three crabs offered them to us for our part in unintentionally solving how he was winning every hand. As they packed up their remaining clams, departing to find another player, they turned and each put a claw to their mouth. We finally got it. Clearly a gesture asking us to maintain a silence about our witnessing the activities of crabs during the winter months, we nodded our agreement. Not a word!